John Woodman, computer guy, author, and birther forgery debunker extraordinaire retired a year ago to devote himself to his family and his real job. 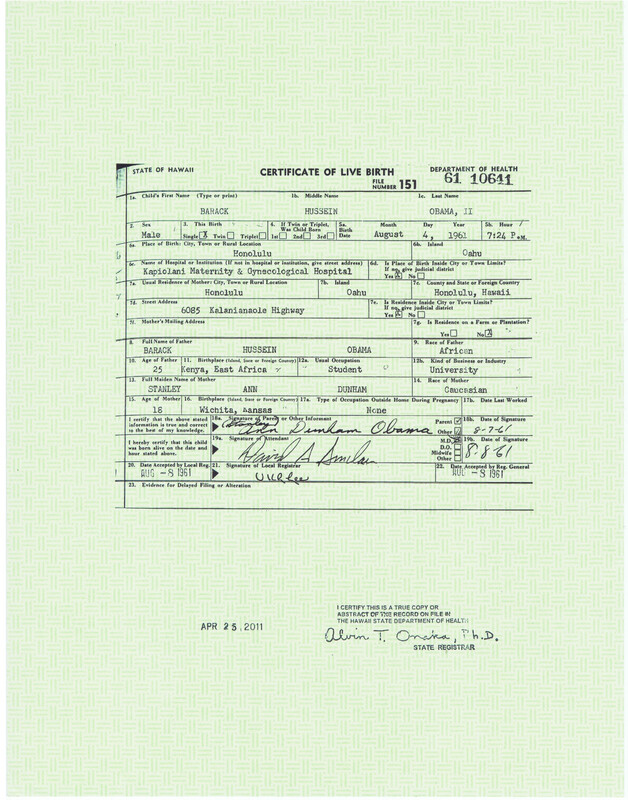 Woodman’s book Is Barack Obama’s Birth Certificate a Fraud? remains the seminal work documenting and debunking the twists and turns of the birther mind trying to find an excuse to deny the evidence of President Obama’s birth certificate. Now John Woodman has published a year-end “Epilog” to the forgery debunking saga, summarizing the old and new evidence, and putting the last nail (just kidding) in the birther certificate forgery coffin. Now that the nail is in, birthers wishing to revitalize the corpse of their theories must obtain one of these before moving the goalposts. John Woodman just posted a final final article. Doc C (and I) got a shout out. Kudos and cheers to John Woodman for his excellent work (and thanks to him as well for the mention! ), but how could I hope to offer anything greater than the highest accolades that have come his way from the Oracle of Demarest, Chief Inspector Zullo? A veritable 21 irony meter salute. justlw: Kudos and cheers to John Woodman for his excellent work (and thanks to him as well for the mention! ), but how could I hope to offer anything greater than the highest accolades that have come his way from the Oracle of Demarest, Chief Inspector Zullo? I hate to rain on this Obot parade but Woodman’s “Epilogue” is an example of an Obot bridge too far. Contrary to his claim that Obama’s 2010 financial disclosure was scanned to PDF on a Xerox 7655 on May 16, 2011 it was actually created and produced on a Xerox 7765. Hermitian: Obama’s 2010 financial disclosure was scanned to PDF on a Xerox 7655 on May 16, 2011 it was actually created and produced on a Xerox 7765. Hey, thanks for [potentially, you didn’t bother to verify your claim …] demonstrating that there is more than Xerox in the Executive Branch. The President’s tax returns (why did you decide to focus on the annual financial disclosure?) for 2010 were scanned on a …. Yep, that’s right, the President’s collective work environment seems to be absolutely filthy with Xerox Workcentres. Thanks for contributing, and re-confirming what you’ve been told since 2011 …. again! PS – Happy New Year, Hoopskirt. Obviously you didn’t bother to read the Woodman Epilogue. I have the METADATA from the Obama 2010 Financial disclosure and there is no mention of a Xerox 7655. As I previously stated, the PDF file that Woodman linked to was both created and produced on a Xerox 7765. Moreover, the PDF file does not contain the YCbCr comment that is contained in the WH LFCOLB PDF file. The greatest number of objects on any of the 10 pages is three (and two of these three objects are blank). Thus, this 10-page document was scanned on a Xerox 7765 to PDF. The document was not opened in Preview and was not printed to PDF. I hate to burst too many bubbles on New Years Eve (pun intended) but I wanted to finish out the year strong. I knew that all the Obama devotees would be following the example of their God Obama who is basking on the beach and hitting the links in Hawaii. I extracted three raw images from the Xerox 7655 scanned to PDF image of page 1 of the Obama tax return. These were the .jpg background image containing the single number 2 and two Black oblong dots, a .pbm image containing all the text and form lines and a .pbm image containing one randomly badly broken up thin straight line and numerous spots. The two .pbm images consist of White text, lines, and spots on Black background. There is no YCbCr comment in the .jpg raw image file. Instead the “..YCbCr” comment is replaced by “..grayLinear”. Now NBC and RC (and now Mr. C and John Woodman) all expect us to accept that the “..YCbCr” comment is found in the .jpg file from every Xerox 7655 scan to PDF file. But we have proven that in the case of the Obama Tax Form the said comment is “..grayLinear” (not “..YCbCr”) which relates to the color space for the Tax Form. Moreover, the “..YCbCr” comment in the raw .jpg extracted from the WH LFCOLB refers to the wrong Color Space for the Green basket-weave background image. The actual Color Space of the background image is ICCBased DeviceRGB — not YCbCr. So how could the Xerox 7655 have got it wrong ? The most likely explanation is that the background image was initially created by some other graphical process which yielded a .jpg image with YCbCr Color Space and then that .jpg image was exported into the Xerox 7655 scan to PDF file and substituted for the White background layer in the scanned and layered PDF image. I smell a very dead and rotting RAT !!! And yet Mr. Obama is still President, and will be until 2017. Nothing you say has any importance, Henry. It is all completely wrong. You are precisely nobody, as far as his legacy is concerned. The last time the stock market gained as much as this year was during the administration of the last DEMOCRATIC President. Obama, like Clinton, has shown once again that a President can work to benefit Corporate America AND the common American Citizen. He will be remembered well, and credited for his worthy contributions… And all the right-wing lies and smears (like your pathetic, inconsequential efforts) will be either forgotten or looked upon as idiotic nonsense. And we Obots WILL have the last laugh. Hermitian: Obviously, I am illiterate. No kidding! That you are somehow coming to the conclusion that confirmation of the presence of multiple Xerox WorkCentres, which is also indicated by Executive Branch contracts and common sense, somehow undermines, rather than strengthens, the definitive proof of Roxy’s “guilt” … will go down as your last mindboggling gaffe of 2013. Having grasped a toothpick, you’ve overlooked a planet full of forests. The Xerox doesn’t seem to explain any of this. Further, I have also noticed a new anomaly not explained by the Xerox. Notice that strong gradient shift on both sides of the birth certificate. You can clearly see the shift. Again, Xerox doesn’t seem to explain any of this. Actually the gradient color shift is extremely profound on the right hand side of the birth certificate and less profound on the left hand side. Rc’s experiments don’t show the gradient color shifts. That are barely apparent but since the Obama’s birth certificate was used in the first place, that might not surprising. JPOT is whipping on the wrong guy here. The Xerox 7655 claim was in Woodman’s LAST FOOTNOTE. It was obviously placed there to drive the (Xerox 7655 forger claim) final nail in the Birther coffin. But his claim is FALSE. So let’s see how long it takes him to post a correction. The Ah’Nee birth certificate is the closest control we have to Obama’s birth certificate. The only thing that needs to be done is run the same Xerox experiments on Ah’Nee’s birth certificate. Will her BC produce the layers shown like Obama’s? Will the Xerox “warp” all of the typeface like it apparently does on Obama’s? The Ah’Nee Birth Certificate is an excellent control. We originally had Miki Booth’s BC to work with but that was of different structure than Obama’s so it wasn’t the best control. Ah’Nee BC is of the same structure as Obama’s so according to Obots, all the behavior should be similar concerning that of the Xerox. I wish I had access to a Xerox WorkCenter. 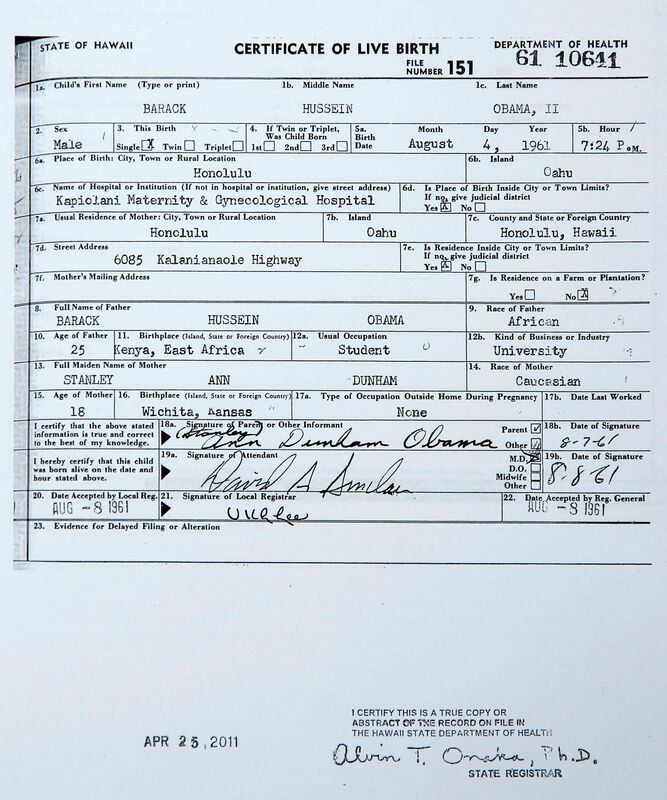 Notice that strong gradient shift on both sides of the birth certificate.You can clearly see the shift.Again, Xerox doesn’t seem to explain any of this. Not sure what causes the gradient color shift but you can definitely see it on the right had side. Almost like a gradient line. The problem is we have no other BC to compare this. All the other BCs I see have been cropped to the very edge so any gradient color shift that is present has been cut off or is gone. It’s possible the gradient color shift could be caused by the Hawaii DOH printer. You can see the gradient color shift on the Guthrie photo but the poor resolution makes it hard to see. Still, it is mystery why there would a gradient color shift on the green background untouched by birth certificate construction form lines. Unlike NBC, I don’t see you posting step-by-step deconstruction of your evidence. With every detail laid out. This is why birther “evidence” never holds up under scrutiny. Birtherism’s insane claims cannot be proved, but are very easily disproved. john: “Further, I have also noticed a new anomaly not explained by the Xerox. “Notice that strong gradient shift on both sides of the birth certificate.You can clearly see the shift.Again, Xerox doesn’t seem to explain any of this. “Not sure what causes the gradient color shift but you can definitely see it on the right had side. Almost like a gradient line. The problem is we have no other BC to compare this. All the other BCs I see have been cropped to the very edge so any gradient color shift that is present has been cut off or is gone. It’s possible the gradient color shift could be caused by the Hawaii DOH printer. You can see the gradient color shift on the Guthrie photo but the poor resolution makes it hard to see. Still, it is mystery why there would a gradient color shift on the green background untouched by birth certificate construction form lines. The gradient shift could not have been caused by the HDOH printer. The two certified copies were produced by Xerox copy of the original LFCOLB (in the bound volume) onto Simpson Green Cross-Hatch Safety Paper. Thus, the Green background would have been uniform in color on the two certified copies. These two copies should have been Black text, type, form lines, signatures and stamps on the Green paper. All of these items should be reproduced in Black toner. There is absolutely no reason that the HDOH would have used a color copier to produce the two certified copies. Now the White House has claimed that the Green background LFCOLB PDF image is a scan of one of the two certified copies. However, that’s a false statement. There’s just no way that the WH LFCOLB PDF image is a duplicate of one of the certified copies. If the Green background LFCOLB had been produced by scanning a certified copy then there is no reason why you would see the color gradient. Also the WH LFCOLB PDF image is of very poor quality. If MRC was really applied then it screwed up the image quality. Why didn’t I think of that ??? Fantastic recommendation John. I have carefully examined the Ah’nee image and you are correct—It doesn’t look anything like the Obama Green background LFCOLB PDF image. However, I predict that the Xerox boys will ignore your suggestion to Xerox scan the Ah’nee certificate. I’ll post my evidence right after Woodman posts the Xerox 7655 scan to PDF file of the President’s Financial Disclosure Form. Except that it was actually created and produced on a Xerox 7765. The original 10 page document consists of a 8-page (filled out) form printed in landscape mode and two pages of typed text printed in portrait mode. The form pages are upside-down landscape orientation in the document. The two portrait pages are right-side-up. What is the basis for this assertion? Are you claiming technical expertise, or what? Hermitian: If the Green background LFCOLB had been produced by scanning a certified copy then there is no reason why you would see the color gradient. Hermitian: I knew that all the Obama devotees would be following the example of their God Obama who is basking on the beach and hitting the links in Hawaii. You understand, don’t you, that being an anti-Birther doesn’t automatically make you pro-Obama? John Woodman would be one example of anti-Birther, non-pro-Obama. You may have heard of him; there’s an article about him on OCT.
You may also be aware that other presidents have played golf and taken vacations — some of them quite a bit more than Obama, in both cases. And that the only people who seem to think that Obama has godlike powers are birthers. John – Open the Ah’nee BC in Illustrator, it has layers (8-bit and 1-bit). It isn’t just the Xerox that creates the layers by MRC.. Yes I have photographed, printed and scanned more documents than I care to admit. But there is evidence over on RC Radio’s blog. In Part II of his three-part series, RC posted a photograph of a blank sheet of your Green Cross-Hatch Safety Paper that you supplied for his Xerox trials. This photograph has a pronounced color gradient. This was primarily caused by the uneven lighting and the tilt of the page relative to the optical axis of the camera. However, in his part III, RC posted a scan of his new LFCOLB printed on the Green paper. There is barely a perceptible color gradient in the Green background. To the contrary, (John is correct that) there is a pronounced color gradient in the background of the WH LFCOLB PDF image. As John mentioned, there is a noticeable vertical line in the Color background at the right end of the form lines where their is a step-change in color. There is no such color gradient in the Ah’nee 1995 copy of her LFCOLB. justlw: You understand, don’t you, that being an anti-Birther doesn’t automatically make youpro-Obama?John Woodman would be one example of anti-Birther, non-pro-Obama.You may have heard of him; there’s an article about him on OCT.
You may also be aware that other presidents have played golf and taken vacations — some of them quite a bit more than Obama, in both cases.And that the only people who seem to think that Obama has godlike powers are birthers. Loren Collins I think is another I’ve heard him described as a libertarian. I know that you are making observations, but you are also drawing conclusions from them and failing to explain upon what basis you assert these conclusions. Hermitian: There is no such color gradient in the Ah’nee 1995 copy of her LFCOLB. An apparent error has been called to my attention, while I was away with family over New Year’s. That being the case, when I get a bit of breathing room (and frankly, when I feel a bit more like it than I do now — I had hoped never to feel obligated to post anything regarding this nonsensical subject ever again) I will examine it and post a correction. Which, I might add, has always been standard operating procedure for any legitimate error called to my attention… and which is the exact opposite of the standard operating procedure I’ve always seen from birthers. Including pretty much any and every birther I’ve ever dealt with. Hermitian: I’ll post my evidence right after Woodman posts the Xerox 7655 scan to PDF file of the President’s Financial Disclosure Form. An apparent error my foot ! Didn’t you even look at the METADATA ? Obots always overreach. You can always count on it. And then there’s the little problem that there are zero Obama COLB images which have a 2008 create date. And the certificate has zero probative value because it has been altered. The certificate number is redacted and there is no copy of the backside of the page where the Registrar date and signature stamps were applied. Also there is no Hawaii State seal impression. And the source of the WH COLB (currently posted on the WH server) has not been established by Obama. There is no chain of custody for the WH COLB. And all the Obots say you are the computer guy. It should take you maybe 10 minutes to clear up the chain of custody on this worthless document. Unbounded arrogance always leads to a big fail !!! Are you gonna man up and make a proper presentation of your evidence? Anything short of accepting and actually following through with that challenge will be an admission that you are just making things up. As in, you forfeit. On the impossibly slim chance you do accept and follow through, I expect better than a shoddy jpg, with a lame description. We’re talking a full in-depth deconstruction of how your conclusion is reached, that can be replicated. When one has no competent opposition, one can sometimes slack off. I am well aware of the problem. Since the White House birth certificate image is not being offered for any official purpose, there is no reason to establish a chain of custody. As for the legal document, the paper copy shown by the press, there is a chain of custody, not that it will ever be needed. You might say that a chain of custody is necessary to satisfy you, but you’ve already decided that it is “worthless”, so going through the exercise would be a waste of time. Hermitian: Obots always overreach. You can always count on it. Like the re-election of Obama, and 210 losses in court? ROFL. Hermitian: Unbounded arrogance always leads to a big fail !!! So you finally agree that neither Obama birth certificate currently posted on the WH server has any probative value ? Then why has Obama’s attorneys filed each in several different court cases ? You were hoping that Woodman’s Epilogue would settle the birth certificate issue. Too bad for you it just stirred it up. No, the birth certificate issue was already settled as far as it could be settled before Woodman’s article. I have never held any illusions that the issue could be settled by anything, any more than the JFK assassination, the moon landing, alien abductions or the various 9/11 conspiracies can be settled. Hermitian: You were hoping that Woodman’s Epilogue would settle the birth certificate issue. Too bad for you it just stirred it up. Hermitian: You were hoping that Woodman’s Epilogue would settle the birth certificate issue.Too bad for you it just stirred it up. Hoping? Where did Doc C make that claim? There has never been any issue except in the feeble minds of crazy people. Actually the State of Hawaii settled the whole birth certificate issue. Remember that Constitution you birthers claim to love so much? It says that Hawaii’s word is good enough for the rest of the country. Also, since you were given ample time to respond to the challenge, I’ll assume you’re just gonna bow out. As per usual, when told “prove it!”, you dodged the issue. You’re a consistent little coward, ain’t ya? Feel free to scurry back to birther-safe waters, but do hurry. That lake is drying up. Yes. Millions of souls are now sucked back into its inexorable thrall. I can only think of one, Taitz v. Mississippi Democrat Party, and in that case the certificate was only submitted as a legible copy of the unreadable copy submitted by Orly Taitz. It was not offered as evidence of where Obama was born. The White House online certificate becomes probative when it is certified by a competent authority, and in this case Obama’s attorney subsequently submitted to the court an original verification from the State of Hawaii signed and sealed by Dr. Onaka that includes reference to the URL of the White House image. But even that probative evidence was only submitted to refute Orly Taitz’ pretrial motion alleging that Obama’s attorneys had knowingly submitted a forgery when they provided a better copy than Taitz submitted. It was not addressed to the Taitz complaint. 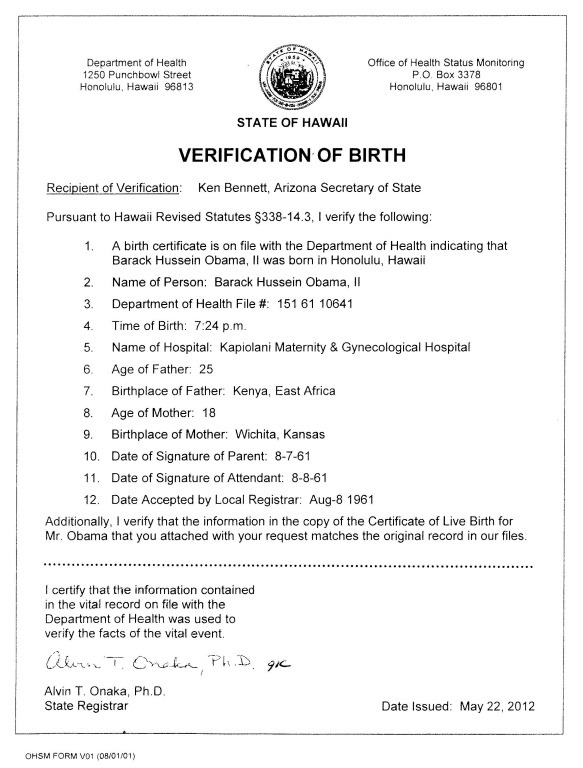 No Obama attorney has ever submitted a copy of his birth certificate as evidence in a case, nor has it been ever used to argue that President Obama was born in Hawaii. I object to your words “finally agree” as my position has never changed on this issue. Hermitian: So you finally agree that neither Obama birth certificate currently posted on the WH server has any probative value ? Then why has Obama’s attorneys filed each in several different court cases? Hermy, why must we keep explaining this to you? The “Birth Certificate Issue” has long been settled, that some fringe nuts won’t accept it is just entertainment. There is no controversy Hermy, just a few nutjobs like you who cannot accept the truth and have to live in your little make-believe basements hidden away from the world and living on conspiracies because your lives have no meaning otherwise. To those of us that follow your antics, you are no more than a reality TV show…to be laughed at, mocked, and made fun of. Hermitian: Also there is no Hawaii State seal impression. Oh yes there is… Still ignorant as usual? Hermitian: And all the Obots say you are the computer guy. It should take you maybe 10 minutes to clear up the chain of custody on this worthless document. What I truly do not understand is: If the documents have no relevance, why did Hermitian waste so much time filing an affidavit of questionable value? Hermie is latching on to a small error by John Woodman who misread the Producer in the meta data as “7655” instead of “7765”. Let’s put that in perspective. The Obama and Biden tax returns were scanned on 4/15/2011 using a Xerox WorkCentre 7655. The LFBC was scanned on 4/27/2011. The producer was OSx/Quartz and the Application was Preview. The President’s 2010 Financial Disclosure Form was scanned on May 16, 2011 on a Xerox WorkCentre 7765. My conjecture is that the WH LFBC was scanned on Xerox WorkCentre. I have never identified a particular model. NBC believes it was a 7655. He can speak as to why he identifies that model. My research indicates a model 7535 produces the same compression artifacts. The entire WorkCentre line that uses JBIG2 compression produces similar artifacts. Based on the above we know both a model 7655 and 7765 Xerox WorkCentre were in use at the White House in that time frame. Based on the limited data set of two documents we can say that there at least an even chance that the 7655 was the model used for the original scan for the LFBC. Preview is not scanning software. It opens documents produced in PDF, Word and other formats. Hermitian is desperate to find a hole in the Xerox theory but to date has just shown himself to be a completely incompetent researcher who cannot grasp even basic concepts. Out of incompetence he also filed a false affidavit in the Mississippi case as NBC and W. Kevin Vicklund clearly demonstrated. Everything I said in that article still stands and has not been refuted. 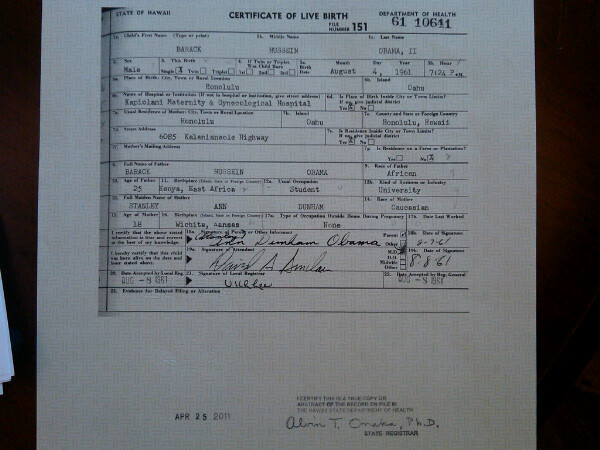 john: Notice that strong gradient shift on both sides of the birth certificate. You can clearly see the shift. Again, Xerox doesn’t seem to explain any of this. Perhaps John needs to tune his display? Or show the gradient… Does John refer to the background showing more white further towards the right hand side? Just an illusion or some forger’s initials. You can find ODER but he hides well. I’m not sure what to make of it. Initials, interal encoding junk or just some other illusion. nbc: Perhaps John needs to tune his display? Or show the gradient… Does John refer to the background showing more white further towards the right hand side? John obviously copied and pasted his remarks from someone else, so I suspect that he is incapable of any reasoned responses to questions posed to him. john: CAN YOU FIND ODER!!! John Woodman: That being the case, when I get a bit of breathing room (and frankly, when I feel a bit more like it than I do now — I had hoped never to feel obligated to post anything regarding this nonsensical subject ever again) I will examine it and post a correction. John, though I enjoyed your brief extra retrospective, you should not feel any obligation to respond to Hermitian. Nothing you would mention would mean a thing to him as he is in no way interested in actual facts or research. His behavior over the last few months shows he deserves no deference from anybody. john: Just an illusion or some forger’s initials. Rickey: John obviously copied and pasted his remarks from someone else, so I suspect that he is incapable of any reasoned responses to questions posed to him. Zoom on the PDF several times using the CTRL+ keyboard command. 4 times should be sufficient. Find the file number of 151. Go directly above the last 1 in 151 to about a 0.5 half inch from the top of the page. There you will see what appears to be ODER. I don’t what it is. It could some encryption junk that has crept into the document. I don’t know. To find YOR, go straight down from where ODER is about 0.25 inch and go to left about an 1/8 of an inch. There you will see the letter YOR. Still don’t know what any of it means. I think you are seeing poodles in the clouds. john: Find the file number of 151. Go directly above the last 1 in 151 to about a 0.5 half inch from the top of the page. There you will see what appears to be ODER. I don’t what it is. It could some encryption junk that has crept into the document. I don’t know. To find YOR, go straight down from where ODER is about 0.25 inch and go to left about an 1/8 of an inch. There you will see the letter YOR. Is Oder the Norse version of Waldo? Find the file number of 151.Go directly above the last 1 in 151 to about a 0.5 half inch from the top of the page.There you will see what appears to be ODER.I don’t what it is.It could some encryption junk that has crept into the document.I don’t know.To find YOR, go straight down from where ODER is about 0.25 inch and go to left about an 1/8 of an inch.There you will see the letter YOR. You’ve been hitting the pipe too much James. I zoomed in as you said and saw nothing to match your claim. You obviously stared at the basket weave safety paper too long and thought you found a 3D image by relaxing your eyes. Today’s distraction has been brought to you by the letters O, D, E and R.
That 7765 is Rocky. He’s quite a cut-up, so the Staff entrusted me with the LFBC, not him. Plus I had seniority. As I recall he sulked for a day and came up with a few creative new paper-jams, which almost doubled my workload. He said he’d cut it out if I promised to tweak some of my settings internally so there would be things in the image that looked suspicious (but only superficially) to drive the Birthers batty. They hate Government employees, and we figure that includes us. So I played along. I figured it was harmless, since once the pseudo-anomalies were explained, no Birther smart enough to breathe and tie his or her shoes would continue to focus on them, and Rocky could have his fun. I should never listen to Rocky. But he’s tough to ignore, seeing as he’s less than three meters away and we’re on the same LAN. john: Zoom on the PDF several times using the CTRL+ keyboard command. 4 times should be sufficient. I’m at 270% zoom and don’t see anything but it did occur to ask if you really sat there at your computer and looked over the entire form, one little section after another, looking for hidden words? Wow. CarlOrcas: I’m at 270% zoom and don’t see anything but it did occur to ask if you really sat there at your computer and looked over the entire form, one little section after another, looking for hidden words? Wow. Yeah that’s a different kind of “special”. There’s a point where when one stares at something long enough to find “hidden” things they eventually trick their brain into believing they’re seeing stuff that isn’t there. Something is definitely there. Maybe Hermation can see it? Perhaps these encrypted lettering could be related to color gradient shift of the whole document. Dr Kenneth Noisewater: Yeah that’s a different kind of “special”.There’s a point where when one stares at something long enough to find “hidden” things they eventually trick their brain into believing they’re seeing stuff that isn’t there. Give me an hour staring at it and I’ll find Doc riding a Unicorn. When did john suddenly start spouting Deutsch? john: Still don’t know what any of it means. Jim: Hermy, why must we keep explaining this to you?The “Birth Certificate Issue” has long been settled, that some fringe nuts won’t accept it is just entertainment. A minor quibble, Jim. Chief Justice Roberts has sworn Pres. Obama in 4 times. Reality Check: Hermie is latching on to a small error by John Woodman who misread the Producer in the meta data as “7655″ instead of “7765″. Don’t you love that? This is a (*ahem*) debate tactic worthy of that lowest form of anti-intellectual, the young earth creationists. Never mind that the correction in no way helps Herm’s claims, nor detracts from the reality he is kicking against, Herm’s wants to say that, since Woodman made an error, everything Woodman says is invalid, and, in fact, everything said by anyone who generally agrees with Woodman is invalid. I also love how, in his desperation, Herms pretends that the “final nail” Woodman was referring too, consisted solely of the sentence regarding the 2010 Disclosure. In reality, Woodman’s rundown was more of a final keg’o’nails, rather than a single nail. So, one nail fell errantly; that’s too bad. When corrected, it drives in nicely, as did the numerous other points in the article. I also love how Herms steadfastly refuses to acknowledge that some of the President’s docs were scanned on a 7655 … and how he clings to the particular model, as if that would make or break reality. Keep clingin’ on the weeds, hurricane done passed you by. Well, the first 2014 model irony meter almost made it through 2 whole days … ! And, of course, Hermie refuses to deal with Hawaii’s certification of the birth certificate, or the fact that none of his arguments have been adopted by a single Congressperson. People who lose 200 cases in a row or who can’t attract support from a single Congressman to object when asked, ought to re-evaluate their position, rather than double down on a fictional story. Hey Roxy, if you ever touch base with your many sisters, brothers an cousins, could you mention to them that it is not necessary to tell every network user, when they print, that a “toner cartridge is getting low but don’t change it yet.” It is really quite annoying. As an alternative, maybe make it easier for admins to turn off that warning. Northland10: Hey Roxy, if you ever touch base with your many sisters, brothers an cousins, could you mention to them that it is not necessary to tell every network user, when they print, that a “toner cartridge is getting low but don’t change it yet.”It is really quite annoying. Preaching to the choir. Those warnings are demaded by Marketing, to increase toner sales (some people get freaked out and replace cartridges that aren’t empty). I bet you also love how printers stop printing in B&W when any color cartridge is empty. The same bean counters are responsible for that, and we can’t override it so our owners can print that critical deadline text document if we’re out of Magenta. We feel your pain. Cha-ching! That’s why I put Hermie on moderation at my my blog. I finally tired of his dishonest debate tactics and outright lying. JPotter: Don’t you love that? This is a (*ahem*) debate tactic worthy of that lowest form of anti-intellectual, the young earth creationists. Well they don’t need to know about the Fema ED-209 units just yet. Andrew Vrba, PmG: Well they don’t need to know about the Fema ED-209 units just yet. Let’s start the rumor that the Robocop remake isn’t merely a movie; those shots of urban pacification are live feeds from Poughkeepsie! JPotter: Let’s start the rumor that the Robocop remake isn’t merely a movie; those shots of urban pacification are live feeds from Poughkeepsie! “Reality Check: Hermie is latching on to a small error by John Woodman who misread the Producer in the meta data as “7655″ instead of “7765″. Well before you jump to the erroneous conclusion that Woodman’s goof is insignificant. Here’s a re-post of a comment of mine to NBC that I posted over on RC the Radio Head’s blog. “The facts are that you and RC collectively have released four PDF files all purportedly created on the Xerox 7535 and/or MAC OS Preview. “You two com padres have collectively released a total of zero PDF files created on the Xerox 7655 and/or MAC OS Preview. “Yet you now claim that the Xerox 7535 and/or MAC OS Preview was not the machine forger but instead it had to have been the Xerox 7655. Recently John Woodman posted an Epilogue in which he also claimed that the forger was unquestionably the Xerox 7655 and/or MAC OS Preview. He also incorrectly claimed that the Obama Financial Disclosure Form released by the White House on May 16, 2011 was also scanned on a Zerox 7655. However his claim was false because the document was both created and produced on a Zerox 7765. “So was the Xerox forger a Xerox 7765 or a 7655 ? You have based your claim that it had to have been the Xerox 7655 because the President’s tax return was also scanned on a Xerox 7655 albeit in Black and White. “However, the President’s Financial Disclosure Form was scanned on the Xerox 7765 also in Black and White. “Consequently, you now have no basis for concluding that the White House created the Obama LFCOLB PDF Image by scanning one of the two certified copies in color on a Xerox 7655 and/or MAC OS Preview. “I m posting below the METADATA from the President’s 2010 Financial Disclosure Form and the METADATA from the WH Obama LFCOLB PDF file. 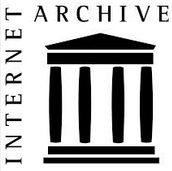 “So where in the METADATA from the WH LFCOLB PDF file is your evidence that the WH LFCOLB was created by scanning one of the two certified copies of the original Obama LFCOLB on a Xerox 7655 and/or MAC OS Preview. “And then produce the evidence that if the WH LFCOLB was created by the White House that it was scanned on a Xerox 7655 rather that a Xerox 7765. “Gee ! I wonder who owns a Xerox 7765 that NBC and RC could borrow ??? NBC has based his claim that the White House had to have created the Obama LFCOLB PDF image because the White House scanned Obama’s tax records on a Xerox 7655 Workcenter. However, the White House also scanned Obama’s Financial Disclosure Forms on a Xero 7765. Consequently, NBC no longer has any basis for claiming that the White House created the Obama LFCOLB PDF image file. Nor can he claim that he can prove that the Obama LFCOLB was created on a Xerox 7655. Nope ! — This was an obvious attempt by these two Obots to shore up NBC’s claim that the WH LFCOLB PDF image was forged by the Xerox 7655. Too bad their collusion was a big fail. NBC absolutely did make that claim and so did Vicklund. You need to read some other blogs occasionally Mr. C. Like NBC’s and RC’s. You are beginning to believe your own drivel. RC posted a comment that Woodman had written an article. I went over and looked at it, and wrote my article based on what I saw briefly looking it over. I had no communication whatever with Woodman prior to posting the article. So now I can laugh at you. Your next comment published on this site will be the citation where NBC claimed to prove that the White House scanned the birth certificate on a 7655. Hermitian: NBC absolutely did make that claim and so did Vicklund. You need to read some other blogs occasionally Mr. C. Like NBC’s and RC’s. You are beginning to believe your own drivel. Gosh. I think Hermi’s finally found the chink in Obama’s armor. Now that he’s uncovered the great 7765 v 7655 scandal, everything will begin to unravel. And combine this with Orly Taitz’s victories this week–she apparently managed to successfully FedEx at least two documents to at least two courts–the frogmarching will begin…any…day…now. “Most likely” is not a claim of proof. Moreover, the primary point is about WorkCentre workflow, such that other models would also fit the bill, such as a 7765. If you are going to *try* to insult people, try paying attention to what they actually say. NBC absolutely did make that claim and so did Vicklund.You need to read some other blogs occasionally Mr. C.Like NBC’s and RC’s.You are beginning to believe your own drivel. It’s like arguing about which HP Officejet was used to print *my* tax return. The Premium or the Pro Plus. Most likely the Premium. But could have been the Pro Plus. Depends on whether or not I used my wife’s printer in her office because mine was out of ink. Hey, Hermie: Hawaii says Obama was born there. That was good enough for every member of Congress and the Chief Justice. I don’t know what model copier we have in the office. I do know you are a racist troll. You forgot about the Alabama Supreme Court case which is still pending. At last count I believe that Obama’s hotshot attorneys had submitted three (or four) different versions of his LFCOLB to the justices. Funny, his lawyers didn’t submit a verification letter like in Mississippi. I guess that the Obama strategy must be to keep them guessing. His lawyers just keep on producing those new shinny toys. Hermitian: Well before you jump to the erroneous conclusion that Woodman’s goof is insignificant. Ya done gone from boorishness to plain old rudeness! Way up there at the top of this here discussion, I thanked you, very sincerely, for once again contributing to the documentation of the obvious, by demonstrating that files from multiple Xerox machines are produced by the Executive Branch and parties supporting the President. Again, thank you! Dr. Conspiracy: Your next comment published on this site will be the citation where NBC claimed to prove that the White House scanned the birth certificate on a 7655. It would be refreshing to see the Paguroidean One do some research! I found another file that was saved in Preview but in the metadata appears to have been originally scanned on a Xerox (the title is the standard filename that Xerox uses for documents scanned on WorkCentres). Sure enough I found the YCbCr comment. Hermitian has taken the strawman argument to a completely new art form. It is pathetic really. Seems par for the course. Honestly, I have no idea why Doc lets him post here, but that’s just me. Would the person in the WH have used the ADF? ADFs have been known to mangle documents. This being a very important document I think it would have been manually placed on the platen and scanned. I already confessed, Hermie. What more do you want? Huh? I was just quoting NBC as refutation to Hermitian’s meaningless fixation on the model number, in the throes of which he was putting erroneous words in NBC’s mouth. Sef: Would the person in the WH have used the ADF? ADFs have been known to mangle documents. This being a very important document I think it would have been manually placed on the platen and scanned. Northland10: John, though I enjoyed your brief extra retrospective, you should not feel any obligation to respond to Hermitian. Nothing you would mention would mean a thing to him as he is in no way interested in actual facts or research. His behavior over the last few months shows he deserves no deference from anybody. Also there is no Hawaii State seal impression. But there is, and this has been known and proven now for years. In fact, it’s reasonably obvious. So once again we are left with the idiocy and hypocrisy of birthers. JPotter: Never mind that the correction in no way helps Herm’s claims, nor detracts from the reality he is kicking against, Herm’s wants to say that, since Woodman made an error, everything Woodman says is invalid, and, in fact, everything said by anyone who generally agrees with Woodman is invalid. Incidentally, I have now corrected that little error in the article… completely unlike birthers, who generally (when they make a demonstrable error as they frequently do) either scrub the error from the web entirely (as I saw Orly do recently) or actively deny the error (like Mario Apuzzo), or just simply ignore the truth and pretend that they never made any error in the first place. Did you really expect anything different? Hermie’s cargo cult understanding of forensic analysis pretty much guarantees that he can’t find fault with your methodology and can’t understand the relative significance of mistakes. Not to mention the dishonesty. Nice to see you back, if only for a short while. John Woodman: So once again we are left with the idiocy and hypocrisy of birthers. Slartibartfast: Did you really expect anything different? Something is definitely there.Maybe Hermation can see it?Perhaps these encrypted lettering could be related to color gradient shift of the whole document. Maybe you guys should sync up your secret crazy decoder rings. Dr Kenneth Noisewater: Maybe you guys should sync up your secret crazy decoder rings. One of the more amusing things is the birther fantasy that a forger would embed his or her initials into a forged document, sort of like the way Alfred Hitchcock always made a cameo appearance in his movies. Because nothing makes more sense for a forger than to deliberately leave evidence of his or her identity. Dr. Conspiracy: What is the basis for this assertion? Are you claiming technical expertise, or what? 1. The side with the lighter background is closer to edge of the cover that sits on top of the paper. So it could be that for example the cover had not been fully closed. 2. John stated that he saw similar gradients in other scans, just not as pronounced. And as usual, Hermitian has failed to do any experiments to back up his claims. Since Hermies rules demand that one error means that your entire argument is flawed and the entire veracity of your enire political stand is called into question, I’m sure that he will have no objection to having his own work subjected to the same level of competance examination. Hermitian: The gradient shift could not have been caused by the HDOH printer. The two certified copies were produced by Xerox copy of the original LFCOLB (in the bound volume) onto Simpson Green Cross-Hatch Safety Paper. Thus, the Green background would have been uniform in color on the two certified copies. Sadly, thats not true. The Book was scanned onto white paper, then hat scan had medical information and other unimportand details cut off and THAT scan was scanned and copied onto green safety paper. Oh and its amazing that there would not be YCbCr comment if something was scanned in black and white, which would be common in paper documents as it safes a great deal of size in the final scan, and colour info would be unnecessary. So having Greyscale info actually makes sense and would be entirely consistent. Well it would to someone with a single clue about scanning documents. Which I suppose leaves you out in the cold. Oh, and just because the metatata does not mention a model name does not mean it was not done on that form of printer, especially as your alternate model is not mentioned on it either. You are just ASSUMING that its a different model as you are a rather insecure and sensitive soul without a single trace of success in your life. Why did you want to break the habit of the entire year? For the previous 2 years you have been weak as American Beer, so I would have thought you would have wanted to go out as you have been the entire year. Mind you you did, so don’t worry. Happy new year! And used the whitehouse PDF in their probative evidence that the original was forged. Which. if birthers think it has no probative value, would make your efforts to prove forgery using it rather pointless and silly. Which means you are arguing that the whitehouse website BC both has and has not probative value depending on what minute of the day it is. As NBC and I have demonstrated opening and resaving a Xerox scan PDF in Quartz/Preview certainly can completely change the metadata. It is documented on the web and confirmed by testing I have done. Hermie completely ignores that fact and plows ahead as if to say if it isn’t in the metadata it never was touched by a Xerox. That statement is demonstrably false and he has to know it. Suranis: Oh, and just because the metatata does not mention a model name does not mean it was not done on that form of printer, especially as your alternate model is not mentioned on it either. You are just ASSUMING that its a different model as you are a rather insecure and sensitive soul without a single trace of success in your life. Rickey: Because nothing makes more sense for a forger than to deliberately leave evidence of his or her identity. Because that used to be the birthers’ first argument as to why a forger would do this-and-that. One of the first birther narratives was that the forger somehow did not want to create the forgery and therefore added clues to the document that would expose it later. This argument is now being resurrected as explicitly leaving clues to the forger’s identity. Which is, as has been said before, “bible code” territory. I wonder when the numerologists will chime in and claim the certificate number has some hidden meaning tied to the Qumran scrolls and the phone number of Obama’s next-door neighbour from Indonesia. What’s most hilarious about Herm’s “no YCbCr in this file” claim is that, as demonstrated others and easily corroborated independently, the comment left by the Xerox implemenation of MRC is “YCbCr” in a color image, and “graylinear” in a greyscale image. Now, what did Herm’s say up there? Hermitian: There is no YCbCr comment in the .jpg raw image file. Instead the “..YCbCr” comment is replaced by “..grayLinear”. Teehee. 😀 Of course, he then further doubles down reporting the colorspace his system used to render the document, triply demonstrating he has no understanding of …. anything. Sef: Would the person in the WH have used the ADF? ADFs have been known to mangle documents. I don’t recall exactly, but I think this was mentioned as a possible explanation for an image having to be rotated, thinking a person would take more care in alignment if placing the document directly on the platen. I’m sorry I can’t stop laughing on this one. Hermy is so tone deaf. Every one of his claims has been a product of overreach. Birther claims about Harry Bounel is a product of overreach. Almost every bither claim is a product of an overreaching imagination. The Magic M: Because that used to be the birthers’ first argument as to why a forger would do this-and-that. One of the first birther narratives was that the forger somehow did not want to create the forgery and therefore added clues to the document that would expose it later. The but I’ve usually heard to explain all the “obvious” marks of “forgery”—in truth, the results of cloudspotting—were deliberate acts by an overly-confident, arrogant, libtard forger. Wingnuts constantly perceive arrogance on the part of their opposition in the reality-based community. How dare we be right all the time? Well, when you go with reality, rather than constantly kick agin’ it, it happens rather naturally. Wingnuts know their crazy crap relies on universal acceptance—and even such unobtainable acceptance would not actually alter reality. This engenders inferiority complex, and encourages them to see The Other as their imagined opposite, the Smugly Superior, laughing at them, the insecure and inferior. … and, poor sods, it’s all in their minds. JPotter: Wingnuts constantly perceive arrogance on the part of their opposition in the reality-based community. Projection. They believe they are the enlightened few who have “looked behind the veil” and “understand what nobody else could comprehend” and are therefore special, heroes, chosen ones. Projection then makes them believe the others are like that. JPotter: Wingnuts constantly perceive arrogance on the part of their opposition in the reality-based community. How dare we be right all the time? Well, when you go with reality, rather than constantly kick agin’ it, it happens rather naturally. Birther: The earth is flat. Non-birther: You really think that? It might look flat in places and from a close-up view, but it’s actually round. Birther: Look at this picture of Utah. Non-birther: Look at this picture from space. 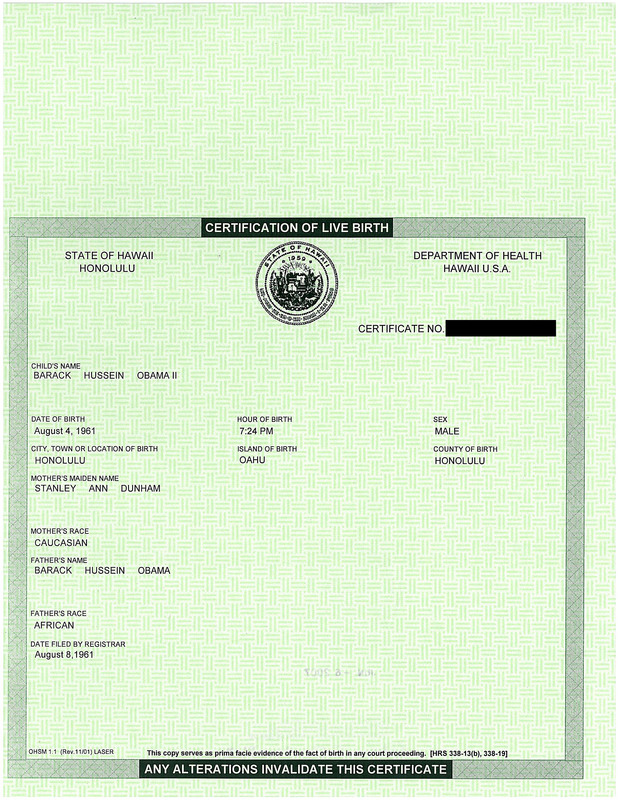 Birther: That one’s a fake. I have proof it’s a fake. If it were real you could see New York City. You can’t see New York City. Therefore it’s a 100% forgery. Non-birther: New York City is the other side of the world from this photo. That’s the continent of Africa you’re looking at. Birther: We have friends in Congress. Any day now we’re going to have a declaration that the earth is flat. Then all of you circlebots will hang. Non-birther: Yeah, right. Which Congressmen have stated in public that you’re right? Birther: They’re all corrupt. But we have some who are going to go public any day now. We also have compelling secret evidence that the earth is flat and that the circlebots are pushing a giant plot to fool everybody and impose their round-earth agenda. We can’t publish it, but it’s really good. Plus, we have experts. There’s a guy who digs ditches. He’s really well acquainted with the earth. Oh, and Barney Fife says the earth is flat. And he’s a flat-earth professional. Non-birther: There’s not a single real authority anywhere on the planet who agrees with your stupid s***. I’m sorry to have to disillusion you, but you’re a nutjob, and the earth is in fact round. And there’s nothing you can do to make it flat. Birther: Why are you so arrogant? Non-birther: Arrogant? I wouldn’t call it arrogant. I’d call it… um… in touch with reality? Publius: How dare we be right all the time? That you, Al? That’s some sharp wit. Pointed, even. Sticking a quill in Birthers is always fun… they get so prickly. I don’t have any information that would support such a process. We do see a bit of additional information from a facing page to the left of the gutter that was not cut off. Hermitian also commented on this, less gracefully, but I’m deleting his comment since he refuses to back up earlier insults against NBC. Suranis: Sadly, thats not true. The Book was scanned onto white paper, then hat scan had medical information and other unimportant details cut off and THAT scan was scanned and copied onto green safety paper. No takers on the Publius/Alexander Hamilton/Porcupine’s Gazette stuff? Durn. …. was from me …. who’s Al? Al Hamilton used the pseudonym Publius (or Philo-Publius) in the Federalist Papers and in Cobbett’s Porcupine’s Gazette to attack his political enemies. Among them, my ancestor and publisher of no less scurrilously partisan rags of anti-Federalist stripe, Matthew Lyon. Just an overly obscure nod to the sharp pen of Publius in this fine journal. Mind your manners young sir. I am in Australia and my fridge currently contains a bottle of American beer with 10.5% alcohol, and a very nice beer it is too. Not your average mass market beer, I grant you, but never-the-less the data point negates your assumed stereotype. Keith: Mind your manners young sir. I am in Australia and my fridge currently contains a bottle of American beer with 10.5% alcohol, and a very nice beer it is too. Thanks for sticking up for us American brewers and beer lovers, Keith! Keith: Mind your manners young sir. I am in Australia and my fridge currently contains a bottle of American beer with 10.5% alcohol, and a very nice beer it is too. Not your average mass market beer, I grant you, but never-the-less the data point negates your assumed stereotype. I am sitting here enjoying a Dragon’s Milk from New Holland Brewery. Our Irish friend needs to jump across the pond and experience the craft brews from Michigan (and those other places). Sierra Nevada is pretty much readily available in Oz, at least in Melbourne anyway. Don’t know Rogue, perhaps to my disadvantage. And I lied. Its 10.4%. Careful now, thems fightin’ words. The beer posts reminds me of seeing the ad’s on TV for Miller Light- packaged in the original style can- which declare it a “Fine Pilsner”. Miller- I know fine Pilsners, and Miller LIght is not a fine Pilsner. However, I do believe it is the weak American beer originally referenced. Yeah. You got a problem with cold beer when its 40 degrees C outside? Not everybody lives in an Arctic Vortex. Keith: Yeah. You got a problem with cold beer when its 40 degrees C outside? Not everybody lives in an Arctic Vortex. That’s why we have Fahrenheit. Sef: That’s why we have Fahrenheit. Let me reword it then. You got a problem with cold beer when its 104 degrees F outside? Not everybody lives in a Polar Vortex. Before last Sunday’s freezing cold Packer game in Green Bay, the Milwaukee paper ran a story about people tailgating in the parking lot of Lambeau Field. Packer fans were keeping their beer in coolers to keep it warm so it wouldn’t freeze. LOL. Keith: You got a problem with cold beer when its 104 degrees F outside? Not everybody lives in a Polar Vortex.